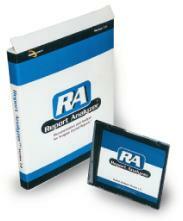 Report Analyzer documents and helps optimize your Crystal Reports. Report Analyzer helps with change management by identifying where database fields, formulas, and more are used in your Crystal Reports. 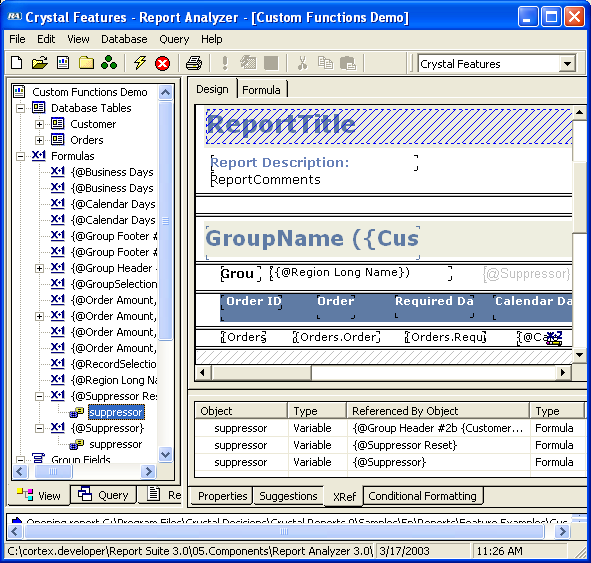 Report Analyzer 5.0 requires Crystal Reports XI runtime files. If you do not have Crystal Reports XI installed on the PC were Report Analyzer will be used, please also download and install the runtime below. The current release of Report Analyzer is compatible with Windows XP, Windows 2003 Windows Vista, and Windows 2008 (R1). To use Report Analyzer with Windows 7, Windows 8, or later, we recommend installing Report Analyzer in a virtual machine using Windows Virtual PC, vmWare Workstation, Virtual Box, or similar software to provide a Windows XP or Windows Vista environment. With Windows 7, the free Windows XP Mode download from Microsoft will provide the needed environment to run Report Analyzer. extensive documentation of your Crystal Reports. Improve your Crystal Reports performance. Report Analyzer automatically detects potential performance issues in your Crystal Reports design settings, including record selection formulas, grouping options and database options. Improve your Crystal Reports reliability and maintenance. Report Analyzer documents over 30 design and style settings in your Crystal Reports. Speed development and maintenance of your Crystal Reports. Dependencies between Crystal Report objects such as formulas, SQL expression fields, parameters and database fields are easily viewed with the dependency viewer. Additionally, the powerful query feature lets you view dependency information across reporting projects. Report Analyzer generates comprehensive documentation of your Crystal Reports with over 100 presentation quality reports. Complexity metrics assist with test case planning and maintenance estimates. Automatically detect reports that do not take advantage of server side database processing. Detect record selection formulas which use data type conversion functions. Detect group fields which use formulas instead of SQL Expression fields. Find report tables which use less than an optimal number of fields. Discover special fields which cause an additional pass over the report data source. Discover unused Formulas, Fields and Variables. Identify group settings which cause blank pages and footers. Identify missing standard Crystal documentation best practices (Report Title, Author, Description special fields). Locate reports which may use the �Convert null field to default� setting inconsistently. Keep versions of your documented reports for historical comparison. View report designs in a design window similar to the one in the Crystal Reports designer program. Select design objects and view/print settings, formula code (including conditional formatting formulas), dependencies with other design objects, and call stacks (for formulas only). Use interactive diagrams (trees) of formula hierarchies, object dependencies and report design elements. Query and print over 600 report settings across all documented reports. Perform instant impact assessment for database changes and formula changes across all documented reports. Locate which reports use specific functions, parameters, and design settings. Generate summary and detailed documentation. Analyze report complexity metrics to assist with test plan development and maintenance planning. Easy to use documentation explorer to browse and compare report design settings. Extensive formula printouts including call trees, object cross references, formatted listing, and conditional formulas. All documentation can be exported in a variety of formats including PDF, HTML and Word. "Report Analyzer does it all. This is the best Crystal Reports 3rd party application on the market today! ...The numerous features combined with great performance makes Report Analyzer the ultimate documentation and analysis tool..."
"Report Analyzer has saved me hours of coding and report examinations!" "We were impressed and regard this as an awesome tool for any professional report designer... We have tried a couple of our own reports with this and wish we had this years ago. You can impress your clients and provide a valuable set of documents next time you are on site."